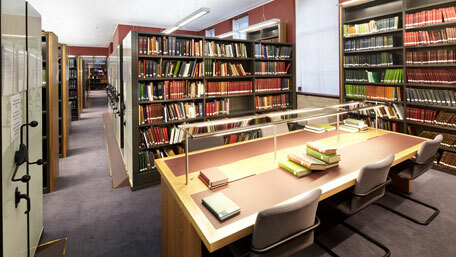 Glass end panels on mobile shelving and timber veneer on static shelving are features of the library of the Institute of Historical Research. The recent installation was carried out by Ecospace for the library, part of the School of Advanced Study in the North Block of London University’s Senate House. Designed by architects BDP, the Institute’s library is located on the first and second floors of the building together with area equipped with mobile shelving in the basement and a current periodicals display on the ground floor. On the two upper library floors, rails for mobile shelving were laid on the existing floor and a wooden infill platform with recesses for the rails was built over the areas where the mobile shelving is sited. Sloping ramps have been provided to allow book trolleys easy access to the stacks. Tall static units are located round the perimeter of both main library floors and in smaller meeting rooms and the veneer on the shelving’s surrounds, principally European white oak, matches furniture in the library and the housings for electronic screens in the smaller meeting rooms. Special lighting units are also fitted to the joinery cladding to all static shelving in order to provide dimmable uplighting and cantilevered down lighting to all aisles.